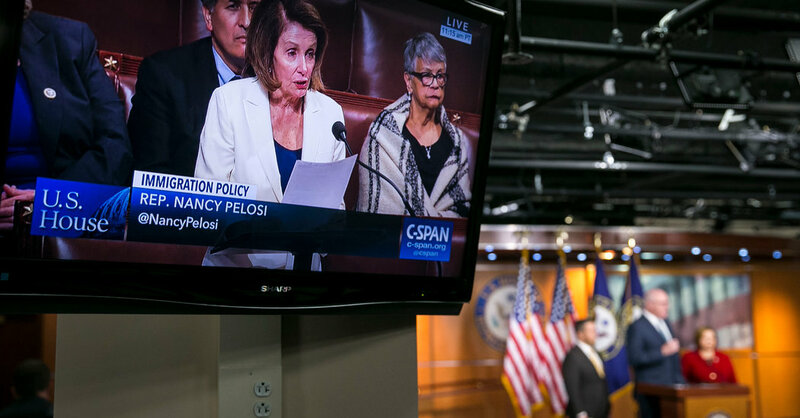 In holding the floor for more than eight hours, Ms. Pelosi took advantage of the House’s so-called magic-minute rule, which permits the majority leader, the minority leader and the House speaker to talk as long as they like. According to the House historian, she beat a record set by Representative Champ Clark of Missouri, who spoke for 5 hours and 15 minutes in 1909 to protest a tariff overhaul. Ms. Pelosi read heart-rending testimonies from Dreamers who had written their representatives about their lives. There was Andrea Seabra, who is serving in the Air Force, and whose father was a member of the Peruvian Air Force. There was Carlos Gonzalez, who once worked as an aide to former Representative Michael M. Honda, Democrat of California. And there was Al Okere, whose father was killed by the Nigerian police after articles he wrote criticizing the Nigerian government appeared in a newspaper. At one point, perhaps running out of stories, Ms. Pelosi suggested she might turn to the Bible. “Perhaps I should bring my rosary, blessed by the pope,” she said. An estimated 690,000 young undocumented immigrants have been protected under DACA, and roughly 1.1 million more are eligible but did not apply. When Mr. Trump suspended the program in September, he gave Congress six months to come up with a replacement. Democrats and their allies had hoped to use the must-pass spending bill to carry legislation to protect the Dreamers. Senator Mitch McConnell, the majority leader, has promised an open debate in the Senate on immigration legislation, with senators of both parties allowed to offer amendments, if a deal is not reached by Thursday. Ms. Pelosi is calling on Speaker Paul D. Ryan to make a similar commitment in the House. “Our basic request is to honor the House of Representatives, give us a chance to have a vote on the floor,” she said as she wound down her talk on Wednesday night. But a spokeswoman for Mr. Ryan, choosing her words carefully, suggested he had no intention of conducting a freewheeling House debate. “Speaker Ryan has already repeatedly stated we intend to do a DACA and immigration reform bill — one that the president supports,” she said. Immigrants’ rights advocates, meanwhile, are furious — not only with Republicans but also with Democrats for failing to exercise their leverage to ensure that the Dreamers would not be left behind. An earlier version of this article misspelled the surname of an immigrant who once worked as an aide to former Representative Michael M. Honda. He is Carlos Gonzalez, not Gonzales. June 1, 2018 Comments Off on Why are so many firms so bad at handling social media?